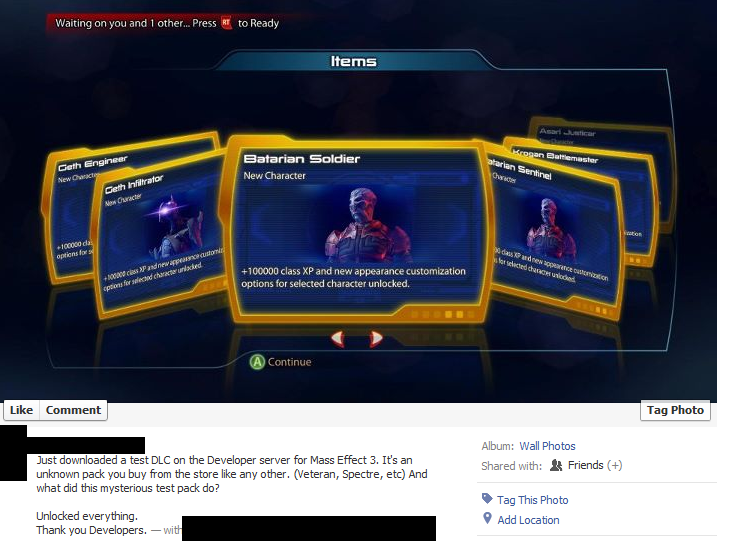 If a leaked screenshot is to be believed, we've got playable Batarians and Geth incoming. 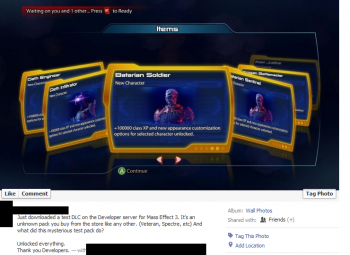 An anonymous poster has revealed a screenshot that seems to imply a new set of characters and classes will soon be padding Mass Effect 3's multiplayer coop experience via some form of DLC. Two new playable races, Geth and Batarian, have appeared, as well as two new classes: the Krogan Battlemaster and the Asari Justicar. If the screenshot is legit, each of the six primary classes would presumably expand from the already-included four to five. The Engineer and Infiltrator classes would pick up a Geth, Soldier and Sentinel would get a Batarian option, Adept would include the Krogan Battlemaster, and Vanguard would accommodate the Asari Justicar, keeping things all nice and symmetrical-like. All characters are shown inside a golden border, signifying a "rare" status. The story of how these six new characters appeared goes something like this: A player with access to the "Developer server" was given the option to purchase (with game credits) a randomized pack. In the standard servers, those packs only include the Recruit, Veteran, and Spectre. On the developer server, players are also supposedly given access to a "test DLC" pack, which is from whence these six shiny new space warriors hypothetically hatched. The brain trust over at reddit (where the image surfaced) have speculated that these characters may be tied to January's announcement of randomized DLC being included with game tie-in action figures, but seeing as how the figures are of the primary cast, it seems somewhat unlikely that buying a plastic Garrus for your desk would somehow directly tie to receiving a Geth Infiltrator in game. For now, it's impossible to say if this will be a free update, a paid DLC pack, or if what we're looking at is just a bit of Photoshop tomfoolery. It does stand to reason, however, that BioWare will eventually pad its popular, yet Spartan coop experience in some form, but the specifics of which will remain hazy until an official announcement is made.